I got my Cornish Cross fryers last Thursday. 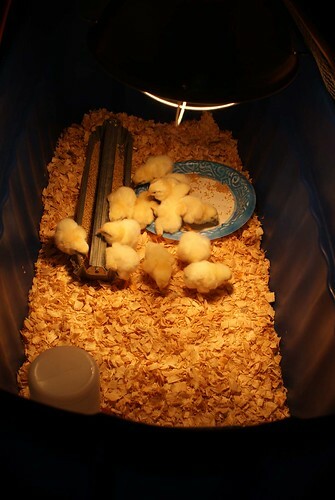 They were a day old and this picture was right when I put them into their temporary brood house aka plastic tub in the garage. Bryon helped me make a screen over the top to keep the critters out and the chickens in. 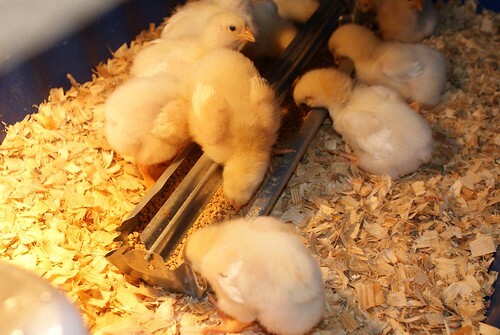 You can see how fluffy and yellow the were. Cute right? 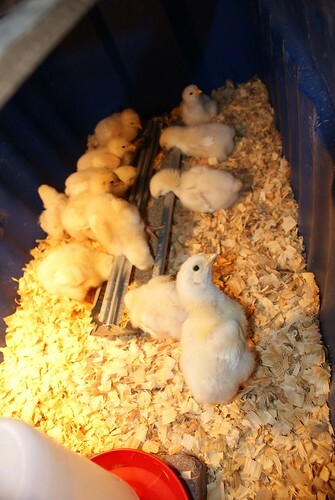 By Sunday they were starting to get little wing feathers and at a week and a half here is what they look like. NOW they are getting tail feathers too. They are already so fat they just lie on their bellies by the feeder and eat. I’m having to fill that trough 3 times a day! I’m definately going to have to get a bigger feeder soon. I think I’ll be able to butcher them the first weekend of June if all goes as plan. Assuming no predators devise a way to get to them in the chicken tractor between now and then. They should be able to go outside in a couple of weeks if it ever warms up again.